We live in a world where parents who are dissatisfied with their public school's performance have a choice in where they can send their children. Unless their child had a scholarship, this was once a privilege denied to families who lacked the income to afford private school tuition. Today there are several options - homeschooling, magnet schools, online schools, and charter schools. However only one is in such demand that it has to turn to lotteries to admit students. That would be charter schools, and although there are presently 6,900 charters in 44 states plus Washington DC , educating a total of 3.1 million students, they remain as controversial - and misunderstood - as they were when the first one opened its doors in Minneapolis in 1992. As with other controversial subjects, there are always people who flock to be counted on one side or the other before they have a firm grip on what it is they are praising or decrying. A 2014 PDK/Gallup poll revealed this is certainly true of charter schools. Before we go on, take a minute to think about what you would answer the following three true/false survey questions. A charter school is a public school. Charter schools can charge tuition. Charter Schools are free to teach religion. But if you're like the 48% who disagreed that charter schools are public schools; the 57% who erroneously believed they charged tuition; or the more than half who thought some charters were free to teach religion, you would be wrong on all three. Yes, the correct answers are true, false, and false, but don't feel bad, even Bernie Sanders got the first one wrong. NPR quoted him as saying "I believe in public education and I believe in public charter schools. I do not believe in privately controlled charter schools." In all fairness to Senator Sanders, his statement, although in error, touched on one of the contradictions of charter management that causes so many misunderstandings. 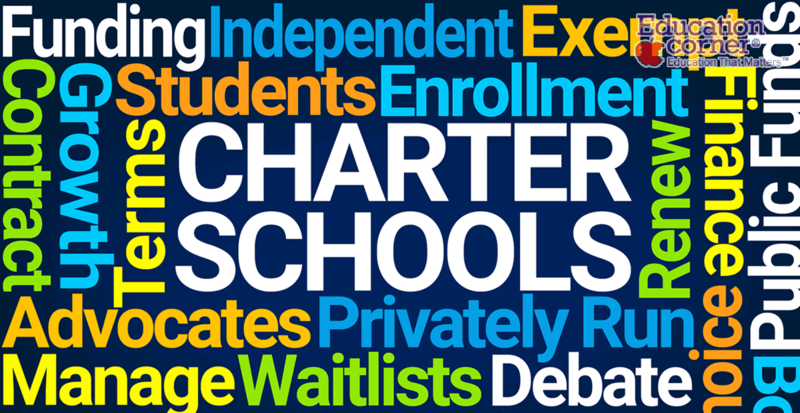 All charter schools are public schools, but some are run by private organizations. What many people don't realize is that all charter schools are public schools although they are run differently than traditional public schools. Traditional public school, or TPS, is a term used to differential them from public charter schools. Both are taxpayer funded; neither can charge tuition; and both are obligated to admit any student who wants to enroll although in the case of charters, more students want to attend than space permits. Where they differ is that while traditional public schools are governed by the district in which they are located and by its elected school board, charter schools are overseen by independent groups which can be for-profit or non-profit. Also, students are not assigned to charter schools as they are in traditional public schools, leaving parents free to choose the charter they think best suits their child. If, as in the case of New York City charter schools, the demand dwarfs the available slots, the schools often resort to a random lottery to fill the available openings. Administrators of charters enjoy freedoms not afforded to other public schools. They are not bound to hiring union teachers so they are not bound by union rules. Some states do not even require that charter teachers be certified. And rather than following a rigid salary scale, many base teacher pay on performance. The abundance of liberties they enjoy mean there is no such thing as a typical public school. Some require students wear uniforms. Some build their curriculums around a single concentration such as art or tech. There are Montessori charters, college preparatory charters, drama and dance academies. Furthermore, they are free to lengthen the school day or the school year. However, there are two things required of them. They must demonstrate student progress and they must maintain financial stability. Each charter school is governed in its day-to-day functions by a school leader or principal. He or she, in turn, must adhere to the contract that spells out the school's mission, fiscal requirements, and instructional goals. These contracts are also known as charters, hence the name charter school. The other party in this charter is the authorizer, an entity that varies from school to school. Whether the authorizer is a university, mayoral office, non-profit organization, independent chartering organization, state education agency, or local school district, the state grants it the power to review charters submitted to it, and if they meet approval, allow the schools to open. Schools are up for review every five years, and should any school not meet the terms of its charter, the authorizer has the power to close the school. However,should authorizers learn of mismanagement, fiscal problems, disciplinary troubles, or anything at odds with the well being of the charter's students. they do not have to wait for a review to shut it down. Most charters are one of a kind standalone schools but some belong to networks, and are run by Charter Management Organizations. Two of the best known are KIPP and Success Academy. CMOs are non-profit organizations. Other networks are run by Education Management Organizations (EMOs). EMOs are another source of confusion and controversy. The confusion stems from the fact that while EMOs are for-profit entities and do all the administrative tasks such as hiring staff, designing curriculum, providing facilities, and setting policies, the schools themselves are non-profits.EMOS are controversial because fiscal mismanagement and fraud have been uncovered in more than a few. While Michigan and Florida have many for-profit charter schools, California banned them in September 2018, and there is a move to do the same in Ohio. According to the March 2018 figures put out by the National Center for Education Statistics, a division of the U.S Education Department, the overall enrollment in charter schools rose from 0.4 million to 2.8 million between 2000 and 2015. Another way to look at this is to say the percentage of public school students enrolled in public charter schools rose from one to six percent. To fill the need, more charter schools opened during this same period bringing the totals from 2,000 schools in the 2000 - 2001 school year to 6,900 for the 2014-2015 school year, increasing the percentage of all public schools that are charter schools from two to seven percent. Unlike traditional public school students who are assigned to specific school in their area, charter school public students choose their school. If no slots are available they are put on a waiting list or, as mentioned previously, entered into a lottery According to an article in Education Week, charter school students make up over 30% of the total public school enrollment in 19 cities including Washington DC and Detroit and the previously referenced NPR article reports that 10% of public school students in Colorado and Arizona attend charters and 30% in Detroit and Washington DC. However no nowhere comes close to New Orleans where charters have enrolled over over 90% of public school students. At the other end of the spectrum, eight states had less than 1% - Alabama, Iowa, Kansas, Maine, Mississippi, Wyoming, and Washington. Many low-income families turn to charter schools as an avenue out of poverty. Faced with the choice between the local school, which in many cases has had a history of poor results in turning out proficient students, and a shot at a charter school, more and more are entering their children's names in the local charter's enrollment lottery. And as demand increases, more charter schools have arisen to serve low income neighborhoods.Although there are many charters in middle income and even wealthy areas, over half (56%) are in low-income urban neighborhoods. The government looks to the number of students who qualify for Free or Reduced Price Lunch (FRPL) under the National School Lunch Program as a way of defining low-income schools. Schools in which 75% or more qualify are considered low-income. In fall 2015, the percentage of students attending high-poverty charter schools was higher for public charter school students (33 percent) than for traditional public school students (24 percent). This does not mean low-income areas have a monopoly on the charter school market. At the opposite end of the income spectrum, 22 percent of public charter school students and 20 percent of traditional public school students attended low-poverty schools, which is defined as those schools in which 25 percent or less of students qualify for FRPL. Media company Vox chose to look at cities with pockets of low-income. They found that, in addition to New Orleans, Washington DC, and Detroit, Flint, Michigan, and Kansas CIty, Missouri also have high percentages of students turning to charter schools. As might be expected, this heavy concentration weights the nationwide numbers. 61% of charter students are low-income in contrast to 48% of traditional public school students.This is in keeping with what the founders of the first charter school had in mind. "A program to rescue hardened kids from the brink of drug abuse, jail or homelessness may become St. Paul's first foray into the educational laboratory called charter schools. The City Academy would work with up to 30 students, ages 13 to 19, who have dropped out of school. Those from homes racked by poverty or substance abuse, those who have made their homes behind fences and bars or those who have no home at all would get another chance to learn." As it turned out, Academy opened in 1992 with a student body of 35 students. Many of these youths were won over by the school's dedication to respect and life learning and its emphasis on individualized learning. That June 17 students, the senior class of 1993 received diplomas. As is true to this day, many were older than the average high school senior. Throughout the years, the school has stayed faithful to its mission, continuing to reach out to students who have fallen through the cracks. Since the majority enter with a deficit in credits of two years or more, and no more than 10% showing proficiency in math or science, the school still adjusts its curriculum from year to year. As a result, most students take more than four years to complete their courses. The most revealing numbers come from the Minnesota Department of Education's statistics on four year graduation rates. When compared with city traditional public schools, 71% of City Academy's graduates completed their studies in four years, only 3 percentage points behind the city-wide TPS district rate of 74% And even more promising, when Business Insider made a follow-up visit to City Academy in 2015', the student body count was up to 168 students, and they were experiencing an amazing drop-out rate of 0%. People still harbor very strong feelings, both yay and nay, about charter schools despite the fact that they have been in existence for nearly 30 years. At first it was mainly traditional public school teachers who feared charter schools would eat up all the available funding and the teacher unions who saw the charter's freedom to unionize or not, as a threat to their membership numbers. But as charter school enrollment continues to mushroom, more and more non-teaching individuals are finding themselves on opposite sides of the charter school fence. have more leeway to offer innovative curriculums since they are independent of state regulations. offer specialized concentrations such as STEM programs and art-focused curriculums. are more accountable since their charters come up for review every five years. expose children to a more diverse population. as a rule, have smaller classes which translates to a smaller pupil-to-teacher ratio, thus more chance for individualized attention. they allow harsh disciplinary measures. force parents to cover the cost of transportation. It can be difficult to ascertain whether charter schools or traditional schools do a better job since it’s hard to design a study that fairly compares the two. Plus, there’s a wide variability in quality between states, school models and even individual schools. To complicate matters further, there is a tendency to treat charters as a monolithic entity whereas location and demographics make a profound difference in student performance. Research has consistently shown that charters in urban areas serving economically-disadvantaged children produce more positive results as judged by test scores than other charters. But might this be traced to the fact that charters in non-urban and urban areas tend to have different goals? Urban charter schools in districts with low performing schools often aim to be better, concentrating on teaching core academic subjects. On the other hand, many non-urban charters in high-performing districts aim to be different, offering unconventional curriculums, exploring different philosophies, themes, or specializations. Another confounding challenge researchers come up against is trying to explain the reason for any gap they find between student performance in charter schools and TSP. Is it attributable to the differences in the schools? or the families who choose charters? Then there's the matter of how children enroll. Do they just show up based on their address,as in district schools? Or must they be approved through a charter school application process? Brookings Institute, renowned for its research, has summarized a number of studies trying to answer just such questions. Most involved both urban and non-urban charters that served varying proportions of minority and economically-disadvantaged students. Some researchers sought to isolate the effects of charter schools by controlling for differences between who attends charters and who attends district schools. Others looked at charters that must resort to lotteries versus those who can allow open enrollment. And still others looked at students who had attended both traditional schools and charters. Despite the strengths and weaknesses involved, and the notable variations in results, all arrived at the same conclusion.Students who attended urban charter schools and students from low-income families, even those in non-urban charter schools, consistently outperformed their TPS peers on state tests. Nonurban charter school students as a whole, and higher-income students,did not. One study cited was carried out by Stanford University's Center for Research on Educational Outcomes (CREDO). CREDO is credited with having assembled the most comprehensive collection of data in the country expressly to compare charter students’ scores with the scores of matched students in nearby districts, While their nationwide analysis showed similar test score gains for district school students and their matched charter school peers, urban charter school students exhibited more growth in arriving at these scores than their district peers. Temple University Professor Sarah Cordes chose to narrow her focus, concentrating on the proximity factor. In contrast to previous research that was conducted on a district-wide level, sometimes comparing schools as far as ten miles apart, Cordes limited her observations to NYC schools within a mile of each other, some of which collocated, sharing the same building. Her 14-year study zeroed in on grades 3-5 and included over 900,000 students. It found that not only did exposure to charter schools generally increase student performance at nearby district schools, the effect was amplified the closer the schools, with the most profound improvements found in traditional public school students in buildings that also housed a charter. Conversely as the circle widened, the effect decreased. But even at schools in close proximity in separate building, attendance improved and the number of grade retentions went down. She also found that children from low-income families and those in special education showed the most improvement. In attempting to find an explanation for her findings, she asked parents and teachers to fill out surveys. She found that both parents and students in the traditional schools that collocated with a charter were more engaged and had improved perceptions of the building's safety and cleanliness. As a balance, she looked at the metrics for schools in which two traditional public schools colocated and found no similar effect, leading her to conclude that it was the proximity of the charter school that made the difference. Instead of quibbling over the question of whether charter schools cannibalize neighboring TPS, might it be in the better interests of all students for districts with excess capacity schools to explore the possibilities of collocating with charters?